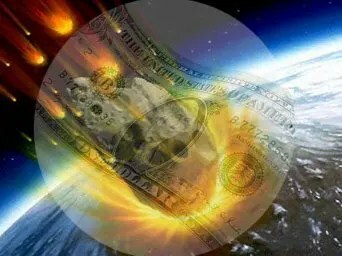 Brace for Impact: U.S. About to Go Off a Financial Cliff! Watching mainstream media you would think a one notch downgrade to America’s debt doesn’t really matter… – [that] the first U.S. debt downgrade in history was no big deal. That, I say, is positively absurd! There are those…who say the downgrade of the U.S. credit rating will be a “wake-up call” for Washington politicians…[and] might pull both parties together [to] get something done for the good of the country and finally deal with the immense problem of debt spending and entitlements. [While] I think this will end up becoming a battle cry for both Democrats and Republicans in the 2012 election [it would appear that, with] both blaming one another for the downgrade,…both parties know the economy cannot be fixed anytime soon, let alone before the 2012 election, so the blame game is what we will be stuck with as the American economy continues to sink. Forget about the “Select Committee” of 6 Democrats and 6 Republicans getting any deficit reduction deal. The fight over spending cuts and tax increases is stuck in a feedback loop. That is part of the reason why S&P cut the credit rating of the U.S. Nothing is going to get done on the debt, at least not before the country goes off a financial cliff. In cutting U.S. debt, S&P also ultimately cut the value of the dollar. Almost all borrowing costs at all levels will rise, and the dollar will sink right along with the slowing economy. Lack of confidence in the U.S. dollar has been pushed to a new and more dangerous nadir in the last two weeks. Dollar selling has been exacerbated by the contentious and virtually meaningless debt deal negotiated by the President and Congress, by Standard & Poor’s downgrading the rating on U.S. Treasuries to “AA+” from “AAA,” and by mounting market recognition of the ongoing U.S. economic and systemic-solvency crises…The dollar’s back is close to being broken. Despite near-term interventions and extreme volatility, the heavy dollar selling that follows will be highly inflationary. . . The kind of impact we are going to have will not be like flying into the side of a mountain. It will be the kind of crash that skids over land, clipping trees and buildings until the plane ends up wingless in a smoldering heap. I just hope the fuel tanks don’t ignite when the long rough ride is over. – The above article consists of reformatted edited excerpts from the original for the sake of brevity, clarity and to ensure a fast and easy read. The author’s views and conclusions are unaltered.